Join us for a wonderful event featuring the striking grace and harmony of Japanese floral design. Akido Bourland, Grandmaster of the San Diego Wabi Chapter of the Ohara School of Ikabana, and Kanako Yamada, an expert in Kokedama, will demonstrate their artistry as they create unique and beautiful designs. 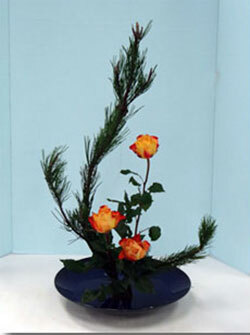 In addition, members of the San Diego Bonsai Club will present a selection of recent creations. The program is free and open to the public. An Asian-themed dinner in the courtyard will proceed the event. Places must be reserved in advance. The cost is $24.00. Annual member meeting: 6:30 p.m.